Happy Publication Day! The Ghost Bride was (finally) published on August 6th!! In a burst of optimism, I auditioned to read my own audiobook and was actually approved. I was very excited about this, as reading aloud is a favourite activity with my kids and brings back happy memories from my childhood when my father read all the Chronicles of Narnia to us. Apparently, audiobooks are more popular than ever. In fact, a number of people have told me that they hardly digest books in any other form nowadays. The reasons for this ranged from “I don’t have any time” to “I like to listen to books when I’m driving”. And of course, there was the Big Caveat. “I can’t stand it when the narration is horrible”. Uh oh. Now that reality was upon me, I suddenly realized that I should have been spending all my free time preparing character voices, practicing pacing etc. Instead, I had been doing things like cooking crustaceans and wondering what kind of snacks to serve at book readings. 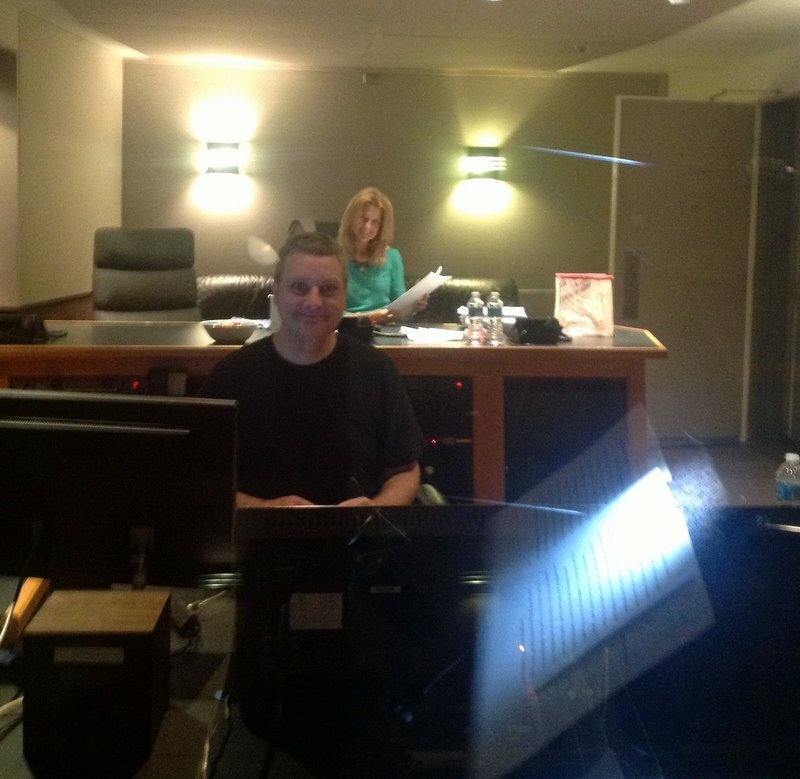 Before the studio recording session, I had a phone conversation with Susan Stone who was going to direct me. Yes, it turns out that studio recordings are directed much like plays are, in terms of pacing, emotion etc. After going through the logistics of the 4 days booked for studio time, she gave me a number of pointers. Such as avoiding dairy for a few days before recording as it tends to stuff you up. Also, consuming apples/apple juice in between takes helps because they contain pectin that coats your mouth and makes things sound smoother. “Oh, and don’t wear any noisy clothing”, she added. Apparently they’d once had an aging rockstar come in to read his memoirs and the sensitive microphone had picked up the squeaks from his leather pants. Yes, I am wearing yoga pants. This is my dream job. “How about yoga pants?” I said hopefully. “Perfect!” she said. I was already smitten with Susan and this only cemented my high opinion of her. 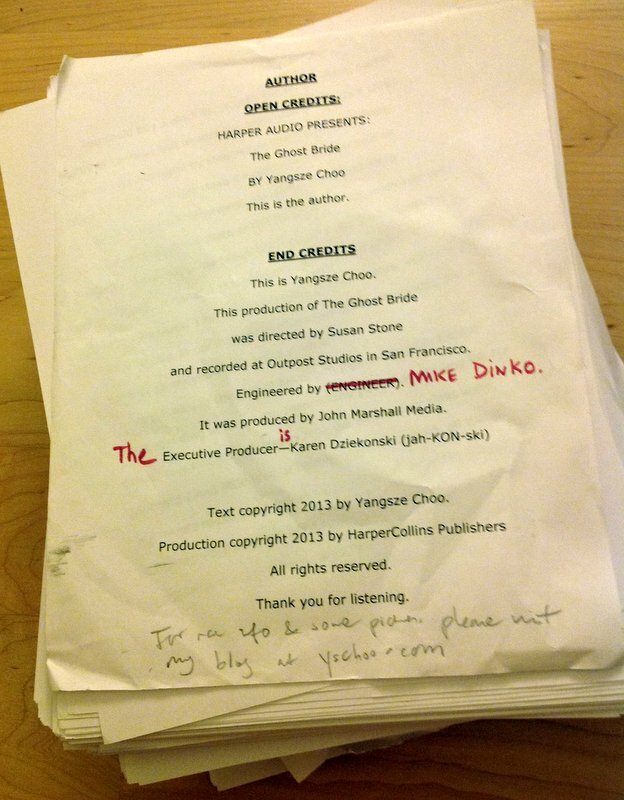 On the first day of recording, I staggered off to the studio with the book script that my publisher had sent me. This was a stack of paper roughly the size of a 15 lb sack of rice, printed in a large font for easy reading and organized so that every page concluded with the end of a sentence. It turns out that digital studio recordings allow you to seamlessly cut out things like the sound of flipping paper, coughs, and things like elevator rumblings. In the old days, as Miik Dinko, the friendly sound engineer, told me, they used to cut out sections from spools of recording tape. Now, it can all be done on a computer. I was very impressed, especially when Miik took the time to settle me in and adjust the microphone and seat. He did this every day of the recording, in case the mike had been moved in the interim. Apparently it was a rather sensitive and expensive microphone. Gingerly, I sat down. A professional recording booth is basically a sound proof box with a glass window and a two way microphone, rather like a high-tech hamster cage. The outer room is where your director and sound engineer sit, together with computers and boards with lots of terrifying dials and switches. Aaaahhhh! I almost let out an undignified squeak, but there was no time. Also, a squeak would have to be edited out. In any case, there were lots of pages to cover and many many characters. Once again, I felt like kicking myself. Why were there so many people? And why were so many of them old men? Opium-addicted old men, grouchy old men, cunning old men… I tried my best to give them all different voices. Susan kept a log of the characters and what they sounded like, so that she could remind me by replaying previous dialogue with them. She did this every day of the recording which was extremely helpful. It was surprisingly exhausting work. We recorded for about 6-7 hours a day, with breaks for lunch and snacks (many, many snacks – I ate lots of cookies to prevent stomach rumblings and doused myself with apple juice “for the sake of art”). But it was so much fun. Although I was terrified every time a new character appeared. My 5″ thick recording script. What? I had clearly missed this option. Never mind that (thanks to my kids) I had been listening to a steady diet of books like Charlie and the Chocolate Factory and had mistakenly assumed that this was the normal way to read an audio book. But in that dim, underground studio, I fell into the world of the novel. All I could see was the words floating on the pages in front of me; it was such a small, intimate space that it felt as though I was speaking directly to a listener, perhaps somewhere driving in a car, or lying on a sofa with earphones on. Telling them a story in the most old fashioned way. Thank you so much, Karen Dziekonski (Executive Producer in NYC), Susan Stone (Director), Miik Dinko (Engineer), and the team at John Marshall Media and HarperCollins who made this happen. It was an amazing experience, and one that I will treasure for the rest of my life. Malaysian food mentioned in the book, including kaya toast, begedil (fried croquettes of mashed potato and minced meat), pie tee, and curry laksa. Do you prefer reading or audio books? How interesting! I am just trying to pluck up courage to do some short sections for a simple YouTube video… this is a whole new world for me. Congratulations., for print and audio publications. You just made history! Congratulations! Sounds like it was an amazing experience. I am very impressed! Can’t imagine how busy you are, but I’ll DM you some links to her interviews, etc., just in case. (Hope it works…Not sure I’ve ever used that Twitter feature.) Best wishes! 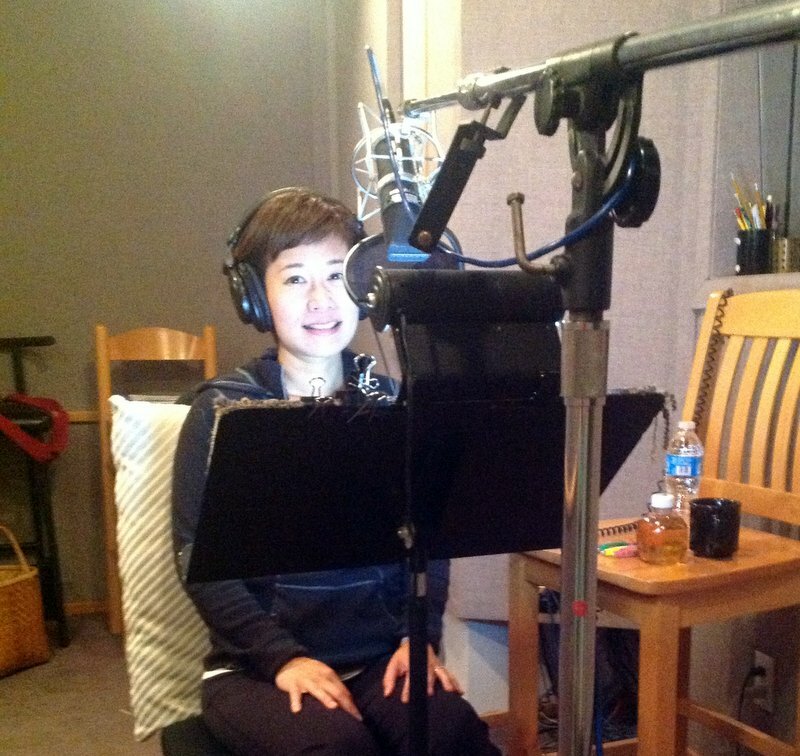 Love this inside look into the word of recording an audiobook. Never even considered what it might be like. Can’t wait to hear the audio version of your book. Like many others, my “reading” diet has been reduced to kids audio books. This will be refreshing. Hi LiLing, don’t worry, I think that many kids’ audiobooks are excellent 😉 For example, have you heard Hugh Laurie’s reading of Roald Dahl’s “The Giraffe, the Pelly, and Me”? It’s absolutely fantastic, plus he even sings!! It is rare that an author can pull off reading his/her own creation — you do it so well! I listen to a lot of audio books, and usually steer clear of ones read by the author after a couple of sadly boring books I encountered. I may have to listen to your audio book after I read the print version! That was a fun look behind the scenes. I’m the type who loves listening to directors’ commentaries on DVDs, so I especially enjoyed this post. I’m very much looking forward to the audio version of your book. So glad you are doing the reading. As a follow up to yesterday’s post featuring “The Ghost Bride.” Such a great book, the author deserves all the success for this debut! Wow, thank you for the reblog! And I just found your lovely and thoughtful review – I’m so happy that you enjoyed it! I loved it and wish you all the best with your book! What an awesome experience recording in the studio- thanks for sharing! I think it’s so neat that the AUTHOR of the book is doing the reading. Congrats on the book release and the audio! I’m honoured that you’ve chosen my book as your reward, and am so happy that you’re excited about it! Plus impressed that you have so much willpower. 😉 I hope the book is a fun read for you and wish you all the best in your upcoming battle! It’s very nice to hear your voice! Thank you so much for taking the time to read the book yourself. Personally, it means so much more that you recorded your own work. I like to think that the intention of your story stayed truer without having it filtered through someone else. I listened to it recently while on vacation. Every night I’d find myself staying up extra hours, hanging on every word in the dark of someone else’s home. I couldn’t have planned it better. I felt more connected to the lead because I too was a far from home and family. You made something magical and I really loved it. Can’t wait to read or listen to more! I’m hooked for sure. Oh, and on the subject of audio vs. print. When I was growing up I read print books constantly. I moved around a lot and books were my best friends. My father would read to me at night when I’d go to bed as well as rent audio books from the library for when we’d drive in the car. He passed away when I was 11. Now that I’m 23 and working a normal job I can’t keep my nose in a book like I used to but I can listen to them. And I do, constantly. I like both methods. The story is the part that matters most but I lean toward audio recordings. Your story about listening to the audio book in the dark was so evocative – how wonderful and I’m very happy that you enjoyed it! Love your voice! BTW, is this a horror book? Can I read it at night time? I just finished reading your book. I couldn’t put it down! I absolutely loved it. The characters were all so interesting. It took me all of 3 days to read it! Thank you so much for writing it! Will you continue to write? I hope you do. 🙂 I also listened to your recording and you have a beautiful way of reading. Keep up the great work and I’m looking forward to reading your next book. I am in the midst of listening to your wonderful story! I listen to audiobooks as I garden and do menial household chores to keep my mind occupied. Because your books is so wonderful, I keep working. I have a rule, you see, that I can only listen while working! Thank you. I finished “The Ghost Bride” in 24 hours. It was utterly captivating. Your writing is just beautiful. *Spoiler*…….I really want to know what happens to Li Lan!!! Please, please, please write a sequel!!!!! I just finished reading your book. It was wonderfully written especially with certain imagination of the afterlife. I enjoyed reading and understand the back ground where you based the story as I am from Penang and have strong interest in the culture and religion. I am listening to Ghost Bride now and I absolutely love it! Your narration is absolutely fantastic. Thank you so much! It’s really interesting how i found this book. I was wandering aimlessly in Borders one day as i was waiting for my friend and i managed to catch a glimpse of this book, i didn’t pay much attention as my lack of courage always steer me as far away from books about ghosts. But it managed to piqued my interest on the subject (Ghost marriages). Since then it has always been in my to- buy list and i finally bought it. I love it! I guess there is really something magical about your book. Will there be a sequel to this book? Er Lang and Li Lan is by far my favorite couple, and i hope to see more of them in the future. Perhaps you should start writing a book series on Li Lan and Er Lang’s adventure! I hope you really do so 😀 Please! Thank you for replying! Happy new year! By the way, I am from Malaysia. I really enjoyed reading your book! I used “the ghost bride” as my literary figure for one of the assignments in the course “Malaysian Literature”! We were required to analyse one work from any Malaysian author. 🙂 Hope to see more new books coming soon! I’ve bought your book on an impulse, the excerpt at the back was so compelling because 1. a living person married to a dead man 2. It was set in Malacca back in Colonial Malaya times! I couldn’t put down the book & read it in a day & now trying to get more people to read it. I love it so much, every time I see it in the bookstore I feel like buying it again. It was beautifully written, a detailed picture of a dated Malaya. I’m listening to your audiobook clip (I’ve never been much for audiobooks) & surprised how pleasant your voice is & wonderful your narration is.